Uranus ~ Genius: “The sudden bolt of a surprise that causes chaos. Uranus, the great awakener, is here to wake you up. According to myth, out of chaos emerged two expressions of deities: Gaia, Mother Earth and Uranus, Father Sky. As the higher octave of Mercury, Uranus arrives to break the rules and smash established structures. It is the planet of not only genius, but also intuition which arrives in sudden flashes, just like lightning, seemingly out of nowhere. Uranus is the revolutionary planet, opening up channels to the higher mind and bringing about necessary changes which can no longer be resisted. The great humanitarian, Uranus is not really personal, and its viewpoint is one that is detached and unemotional. It symbolizes the one who doesn’t really need a partner but is friend and soul mate to everyone. Those under the influence of Uranus are objective just enough to derive reliable insight into other people’s motivations. These types tend to be brainy and cool. Such detachment is needed when everything is about to be turned upside down. Another very important element of Uranus is its link to technological advances and how the future is going to look and be. 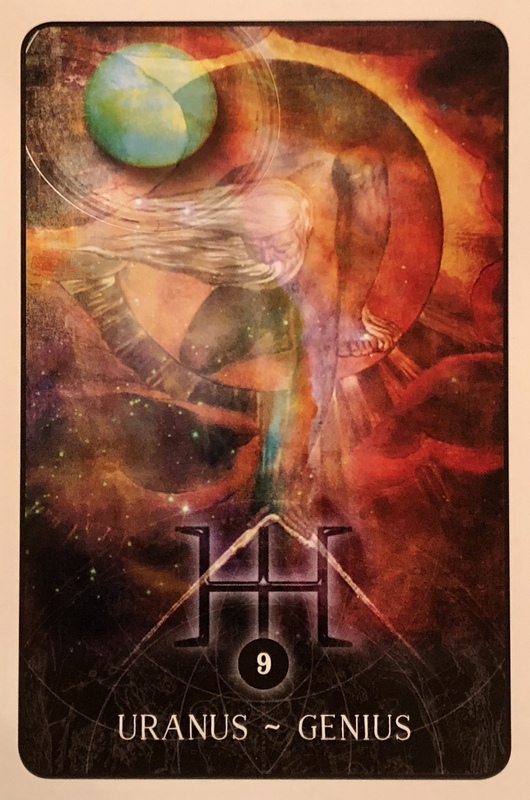 When the Uranus card comes up in a reading, there will be jolts and surprises in regards to your question or focus. After all, Uranus is the upstart planet so there won’t be any smooth ride here. You can anticipate matters to turn rather eccentric, if not shocking, and not in the way you expected. Don’t look upon these manifestations as wrong for you. Instead, go with it and see how your life becomes transformed in ways not exactly as you predicted, but better. You may feel excitable or nervous at present, especially when it comes to the things you are currently focusing on. It may seem as if everything is sped up, even forced against your will, but it is not a good idea to resist. The best approach is to entertain the possibilities of what you are about to learn. You can anticipate this change to be a liberating force, offering a new course or path. Since Uranus is the planet of technology, you may find yourself having to master a new tool, a machine, a computer, or even jobs involving the Internet. Since Uranus is the planet of air, storms and lightning, anything anything having to do with flight, messages carried via the air and electrical energies will be a major part of it. Phones, television sets, computers, artificial intelligence and bionics may also figure. Your surroundings may start exhibiting electrical malfunctions. It is important to pay close attention to the wiring in your home or office. It is also important to point out the connection between Uranus and alternative forms of sexuality and gender identity. In fact, in Victorian England, homosexual and transgender people were referred to as “Uranians.” Therefore, you might find yourself among people with alternative viewpoints, sexuality and sometimes people of a different class or background. As you may have heard, or already be feeling, Uranus transitioned into Taurus yesterday. I would say buckle up but seriously, this is going to go on for some time so it’s better to just do your best to deal with what comes. Expect the unexpected. Change. Surprises. Upheaval. Just as the corresponding tarot card, the Tower, is about bringing down the establishment, things are about to be shaken up. In a big way. It is up to us to see it as good or bad or just necessary in the evolution of All That Is. Yes we will all be affected in one way or another. Individually, collectively, globally. Don’t make this about you, think bigger than that. Don’t hold on to the things that are beyond your control. Get in the water and go with the flow. Make the necessary changes. Do the stuff you have been dreaming of doing. Listen to your inner voice in all it’s wisdom. Stop struggling. Change the way you think about things. All things. Everything. Open up more. Feel into life more. Get into your heart center and make your decisions from there. Roll with it and know there is a higher purpose to it all. Things do in fact happen for a reason even if at first it feels terribly uncomfortable. Find your joy despite it and inspire others to do the same. Dig deep for the connection between us all. Breathe it in; embody it. Blur the lines, see through the veils. And get ready for… well… anything and everything. Just curious, do you hand-pick each daily card or do you rely on synchronicity? Thank you Dee! another good peace of advice! Peace. Thank you so much, Dee, for your wisdom and service for mankind. Your blog is part of my daily ritual. There was an unexpected tornado in my area which is indeed a rare occurrence.